Since I posted my report about Darby’s recent plunge into recreational swimming, Darby remains someone hesitant about taking a dip. She has shoved off and cruised around once or twice, but more often, she’s been content to go onto the steps and just paw at the water. This is FINE with us (less water in the house if there’s less water on the dog), but it seems clear that more swimming is in her future. Rick Spicer, half of the breeder/caretaker team who helped usher Darby into the world, reports that the other day Darby’s sister, Dovie, could scarcely stay out of the pool while visiting another CCI puppy raiser — including taking one dip at 6:30 a.m.
No water in this pool yet. But Ina would be happy if there was. Miss Darby loves balls. 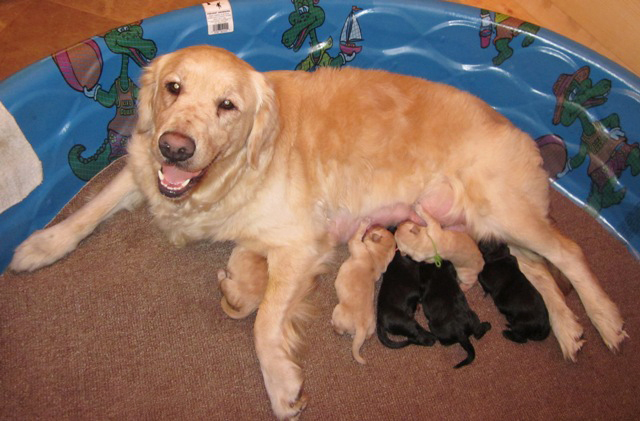 Maybe not as much as the most ball-obsessed retrievers I’ve ever heard of. But still — a LOT. 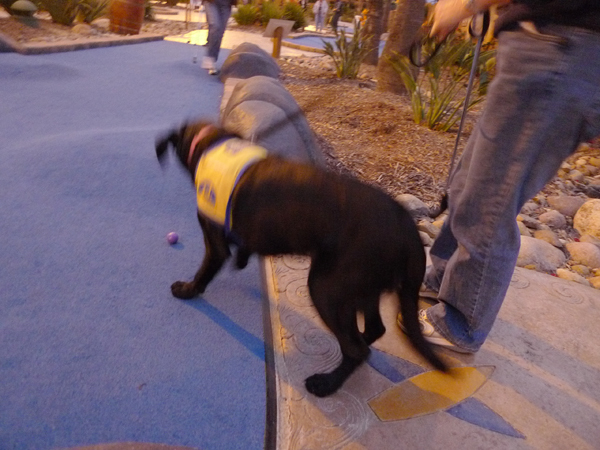 So it was a wonderful challenge to take her on the outing to the Pelly’s miniature golf course (just across from the Del Mar Racetrack) organized by CCI puppy master and Mentor Supreme LeAnn Buchanan. 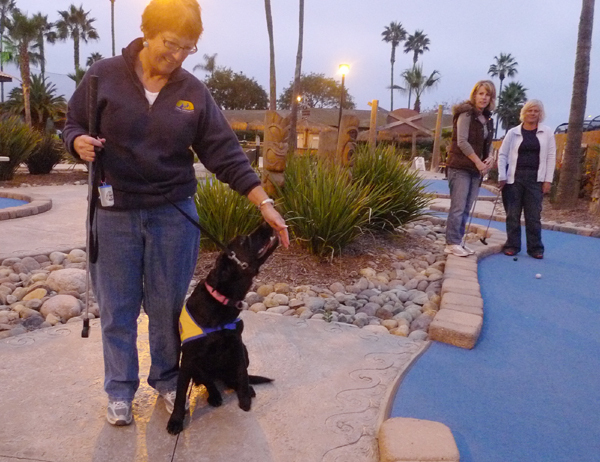 Around a dozen past and present puppy raisers and several pups were in attendance. 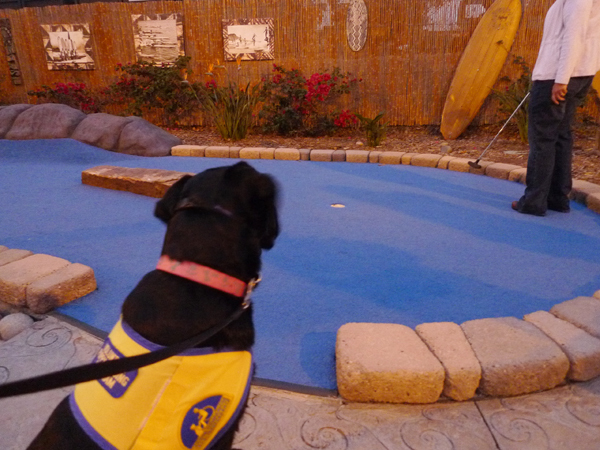 I wound up in one of the groups playing on the surf-themed course, and it was lovely to be able to hand Darby over to other experienced hands every time it was my turn to play. By the end, I was even able to order her to stay while I putted my ball into the hole (all too often after 5 or 6 strokes). As for Darby, she managed to deposit a truly gargantuan pile of puppy poop just off the 11th hole. But that was easily cleaned up (by me). And to her credit, she never once disgraced herself in the presence of all those tempting little balls. This is as close as she got to an attack. She cruised around for a while and seemed to be trying to get the hang of making turns. After a while, she got out. But hours later, we heard a splash and there she was again. It’s been 30 years since we had a swimming dog. Eight months old, that is — today. And I’m taking a pledge to be more consistent about reporting her progress. Like all of our puppies have done, she’s succeeding well in puppy school. She just completed the “puppy kindergarten” section two weeks ago, so next week we’ll begin the “Basic” instruction (already she knows about 20 commands). — She’s the retrievingest retriever I’ve ever lived with. She pretty much can’t go outside without snatching up something — a toy or a ball or a flower or a stone or a twig or whatever‘s on the ground nearby — and carrying it with her. I’ve had more ball-obsessed CCI pups (Brando first and foremost), but no dog who seemed to have more of a need to pick things up at random. Often she’ll bring them to me, and if I don’t notice what she’s got, she’ll circle around and around, occasionally moaning softly. She seems to want me to take whatever she’s got. — She’s the biggest barker of any CCI pup we’ve had. The strange thing is she only barks at Tucker, trying to get him to play with her. While Tucker once in a while can be provoked in this way, mostly he just looks morose at having his eardrums shattered yet again. Annoyingly, we have not yet succeeded in teaching Darby to Speak. — She’s the only puppy we’ve had who every morning delights in pouncing upon her water bowl and digging wildly at it, spilling all the water and then attacking the bowl insanely. At eight months, her worst habits are jumping up on us (and others) — and baiting Tucker with that high-decibel barking. Like most of our CCI pups, she hasn’t yet learned to verbally alert us when she needs to go out to urinate or defecate. So although she’s 95% reliable about toileting outside, we still find the occasional pile in a corner or puddle near the door. But she’s a sweet and charming girl and a champion snuggler who’s easy to live with. We’re looking forward to the next 8 months with her.